Custom manufactured range of weight machine replacement cables. 3. Once the weight machine cable is made, we can either send it to you so you can replace and install the machine cable yourself, or we can send a technician (within our service area) to install the new weight machine cable and adjust your selectorized weight machine. Our services extend to but are not limited to the following brands. 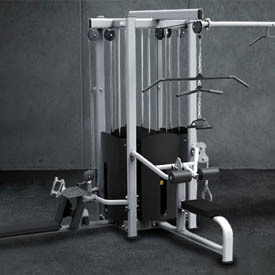 SportsArt weight machines, Hammer Strength weight machines, Promaxima weight machines and even your old standard Global and Universal Weight equipment. We provide a full line of weight machine replacement pulleys and cable parts for those who want to make their own weight machine cables. These can be found at Atlantic Fitness Products.